A frittata is round, deep, savory custard that you make for a large group of people. This frittata recipe features spinach, bacon and cheddar cheese. It's perfect for holiday brunches or other special occasions—even dinner. Cook the bacon in a cast iron skillet over medium-low heat. When bacon is crispy, remove it from the pan, drain on paper towels, and set aside. When it's cool, roughly chop it into 1/4-inch pieces—or just crumble it up. Reserve about 2 tablespoons of bacon fat, then add diced onion and sauté for 2 to 3 minutes or until it's slightly translucent. While the egg mixture is still frothy, pour it into the skillet, and sprinkle the bacon pieces in as well. Give everything a stir to distribute the ingredients evenly. This is the last time you're going to stir, so get it all out of your system now! The reason we cook the veggies before adding them to the egg mixture is so that the water in the veggies has a chance to cook out. Adding raw vegetables to your frittata can cause it to turn out soupy. As for cooking the veggies in the same pan as we cook the frittata, that just makes things simpler, and it's why the skillet you use needs to be safe for the stovetop and the oven. 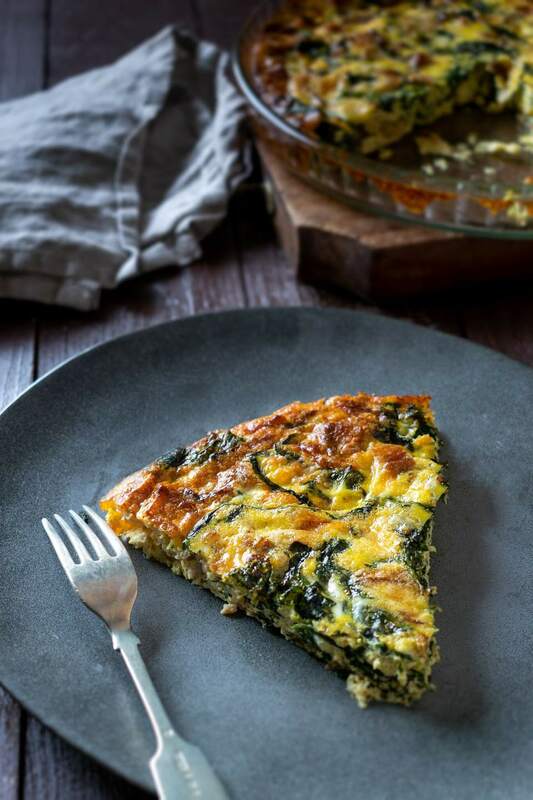 If you don't have an oven-safe skillet, you can pour the egg mixture into a baking dish and add the cooked onions, spinach, and bacon as well as the grated cheese, and just bake the frittata in that dish. If you do it this way, add 5 to 10 minutes to the baking time and check to make sure the egg is fully cooked before serving.